Why have two or even three websites? People find tiny screens difficult to read and operate. Also if a mobile phone has a touch screen, then the navigation menu may be impossible to use unless it is extremely simple or it was specially designed for mobile phone sized screens. Another reason is the exclusive features offered by modern phones such as Camera, Geo-Location (sat-nav), Gyro and Acceleration and of course the obvious fact that phones can make calls. Phone apps and phone websites can incorporate these features to make more engaging websites and applications unique to cell phones. 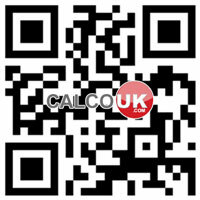 See the calco uk website on a mobile - simply use your mobile phone to go to www.calcouk.com - its fully automated! Alternatively you can just scan the QR code (left) - It's the crossword puzzle looking thing! NOTE - to scan the QR code using your phone you WILL need to have an app installed that understands QR codes. While you could build a regular PC-based website that reads and stores the Bar-code information, it would be somewhat impractical lugging about a PC, camera and wires around Tesco. A mobile app however makes use of the built in phone camera, powerful processing capabilities and the phone's wireless (3G) connection to cloud storage to make a mobile app or website indispensable. On the left the ordinary website displayed on a mobile device. Tiny buttons, text and although the image can be "zoomed" the design elements are all optimised for a desktop computer. On the right the image fills the screen. 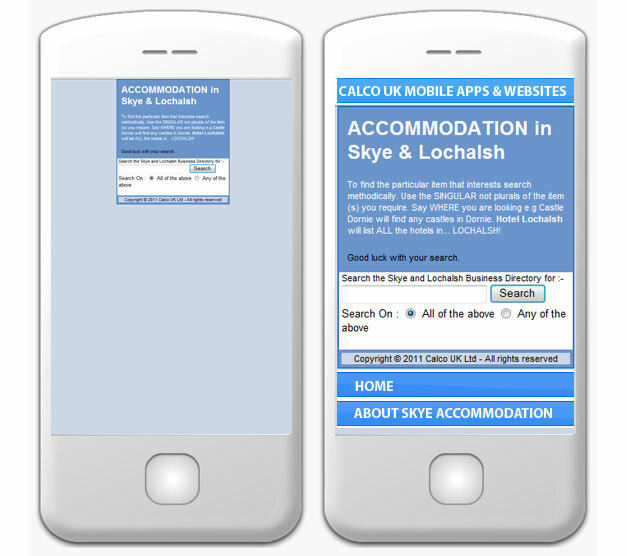 The buttons (HOME and ABOUT SKYE ACCOMMODATION) are large and chunky and designed specifically for mobile devices with touch screens. The Mobile version of the site can be found at http://www.calcouk.com/android and works on most mobile phones that have a browser. Because the website is a MOBILE WEBSITE and not an APP, it works on Apple, Android and Windows phones. A mobile website is not an app (application). It is a website optimised and designed for use on mobile devices and runs in your phone's BROWSER. This means a mobile website will run on any phone that has a browser. An app or application (a computer programme) on the other hand, is software and is platform specific. An Android App will not run on any devices that do not use the Android operating System. Similarly an Apple App is software that will only run on Apple phones, it wont run on Android or WIndows. This means developers designing a solution for phones must write a different app for each target platform. Usually Android, Apple and Windows Phones. Calco do actually develop Android Apps on occasion, however because of cross platform compatibility we mainly write Mobile Websites because one website will work on ALL modern phone brands and operating systems. Mobile Websites work on any phone! All Brands and Tradmarks respectfully acknowledged.